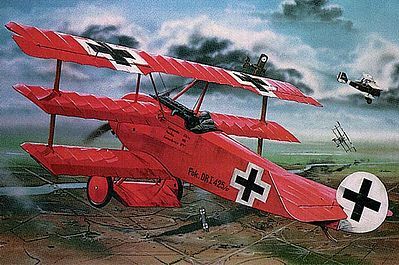 This is a 1/28 Plastic Fokker DR.I Manfred Von Richthofen Triplane by Revell. For modelers age 10 and over, but recommended for adults. Retail $20.95 SAVE 23% ! I must have built 20 of these when I was a kid, and some finished ones for my daughter and nephew over the years. My grandson just learned how to build models so I introduced this classic kit to him and it came our fair enough, not finished at all but I wanted it to be a kit to learn how to build and do decals, so it is quite fine for his desk. He also learned not to pick it up but the top wing. That was a problem with the real Triplane too. Recommend this for anyone wishing a quiet, quick project or a painstaking modification into a nice triplane. Worth the time and yes I will build another one with the refinements necessary now. I learned how to build it too. Skill level 3 includes up to 100 red plastic pieces molded to sprue trees. Detailed cockpit with control column, seat and pedals. Landing gear with movable wheels. There is no cockpit enclosure. I have been modeling for some time, having built this kit when I was a kid. I recently purchased a new one and was surprised to see Revell, Venice Calif, 1957 stamped inside the fuselage. The kit is also stamped 1981 on the landing gear plane at the very bottom. So, Revell must make good kits considering; a. Richthofen flew this in 1917/1918, b. The kit was originally make in 1957, c. I&apos;m building one in 2017. Had some minor fit issues with the machine guns and if you don&apos;t clean up the flash, you&apos;ll have other fit problems during assembly. The decals had some silvering and despite my best efforts I couldn&apos;t eliminate them (the weight table and aircraft identification) and the tail decal doesn&apos;t line up correctly and is oversized so have some Micro Sol/Set. Rigging was easy as was the overall assembly. I have it a good rating but unless you want to spend a lot this is an excellent model to try you hand at WWI aviation. As always, have fun. "A great model and easy to put together"
A simple model already molded in red plastic. It has detail and the figures are relatively easy to paint with brushes. Decals go on nicely. I would recommend a flat finish before and after putting the decals on. Great display model, too. I have mine in my office, where one of my client&apos;s kids stole one of the figures, the Pilot, naturally. 1: Germany's Iron Cross Insignia (1917), Fok.FI102/17. 2: Germany's Iron Cross Insignia (1918), Fok.DRI425/17. 1: Matt Light Olive, Light Green, Matt Nato Olive. Matt Earth, Ruby Red, Ochre, Wood Tan. CAUTION: Not suitable for children age 3 and under. Contains small parts which are a choking hazard. Suggests to use Revell polystyrene cement from the CONTACTA series. Skill level 3 models are more demanding.